Great Britain's eventing team clinched their eighth successive European team title as Tina Cook triumphed in the individual event at Fontainebleau. The British trio tallied 160.5, 92 points less than Italy, who finished with silver while Belgium took bronze. Cook led from start to end on Olympic bronze medal-winning horse Miners Frolic to win individual gold, while team-mate Piggy French claimed silver. "I really didn't expect to do it, I'm so pleased with the horse," said Cook. The gold is the 39-year-old's first having previous won silver and bronze in previous European Eventing Championships. "The Olympics were special and to be a European champion is massive, unbelievable," said Cook. The undulating show-jumping course, the final phase of the four-day competition, proved a difficult test for the riders. With the fences set at maximum height, French was among the few riders to produce a clear round. 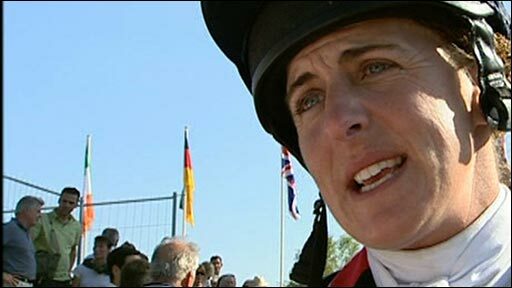 The 29-year-old had only been drafted into the squad to replace Mary King, who was forced to withdraw because an injury to her horse Imperial Cavalier two weeks ago. Germany's Michael Jung had one fence down on La Biosthetique Sam, which saw him drop to bronze. 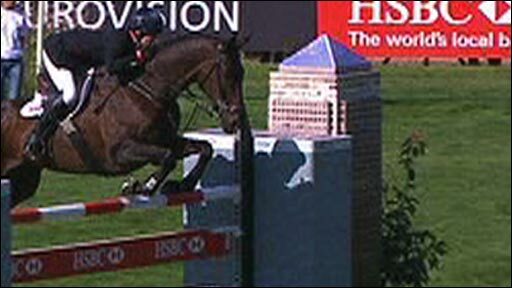 Jung's fault meant Cook had two fences in hand, although she worried British supporters with one down and four time faults. But her score of 46.6 was enough to beat French's 47.3 to take the gold. William Fox-Pitt was agonisingly close to adding a bronze to his team gold, but finished out of the medals in fourth on Idalgo. "I have to blame myself for the second fence down," she said. "He's jumped well all week. It's been a fantastic experience to be part of the team." Britain's other individual competitor, Lucy Wiegersma, also had two down and time faults for 70.2 to finish 13th on Woodfalls Inigo Jones. "He's a young horse and wouldn't have seen an atmospheric stadium like this," said Wiegersma. "The crowd were very noisy but I'm sure he'll learn from it." Team-mate Oliver Townend was forced to withdraw from the show-jumping phase when his horse, Flint Curtis, failed the vets' inspection. The 26-year-old Badminton and Burghley winner, who had had been the joint leader after the dressage, still received his team gold as his elimination meant his score did not count. Britain's hopes for the team gold medal were significantly boosted when France's Jean Teulere did not present his horse Espoir de la Mare for inspection on Sunday morning. Defending European individual champion Nicolas Touzaint was eliminated during Saturday's cross-country event, which meant France could not finish the championship with the mandatory three riders and were penalised 1000 points.